In a new but somewhat unsurprising turn of events, Donald Trump is attempting to strip more marginalized American citizens of their rights. 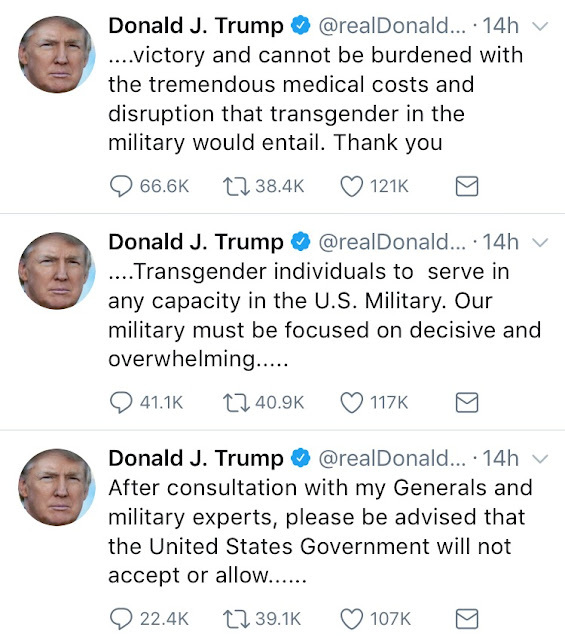 Trump recently revoked protections granted to trans children in schools that allowed them to use the bathroom corresponding to their gender identity, and now has decided that trans people would be a “burden” and a “disruption” if allowed to serve in the U.S. military, the largest employer of trans folx in the United States. For all of the trans people affected by this ban and other discriminatory practices, we’ve compiled a list of both LGBTQ+ and trans-specific organizations and resources to help in your resistance. The Recovery Village - "Whether you’re a member of the queer community, or you’re the loved one of someone who is, this page can address many of your questions. Are you in search of a drug rehab center with treatment programs specifically designed for LGBTQ+ individuals? Do you want more information about substance abuse in this community? You can find answers here." DrugRehab.com - "Substance use disorders have a greater effect on LGBTQ+ people than on the heterosexual population. The LGBTQ+ community must overcome several obstacles, including being denied substance abuse treatment because of their sexual identity. However, through the proper understanding and accommodation of LGBTQ+ care principles, substance abuse treatment can be successful." It is imperative to rally and stand behind our trans family. Please feel free to share and contribute your own resources as well!